Entomophagy is “the human consumption of insects and arachnids as food” according to Entomophagy.com. 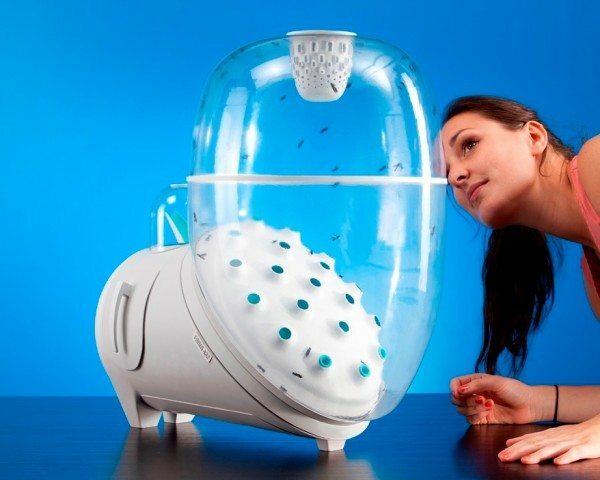 Now don’t get squeamish, but this may very well be the future for feeding the world. Did you know that there are an estimated 10 quintillion (10,000,000,000,000,000,000) insects (about 900,000 species) on the planet according to Smithsonian Information? That seems like a wonderfully massive untapped source of animal protein that would be valuable for feeding the world’s growing population. Even with today’s current food production technology, it’s becoming increasingly difficult to feed our exploding population. Producing the kind of protein that we need using animals like cows, chickens, and pigs is resource intensive and problematic, and many scientists believe that entomophagy will play an increasingly important role in keeping up with this task. In fact, countries in Central America, South America, Africa, Australia, and Asia have long since made insects an integral part of their diets. All that is left is for North America and Europe to join them. Did you know that we already consume trace amounts of insects in our food (the FDA states that “it is economically impractical to grow, harvest, or process raw products that are totally free of non-hazardous, naturally occurring, unavoidable defects” which includes insect parts)? Additionally, if we start to look at insects as the “shrimp” of the land (insects, shrimp, lobsters, and crab are all a part of a group or phylum called arthropods), maybe we can learn to get over our aversion and start including them as a part of our diets. 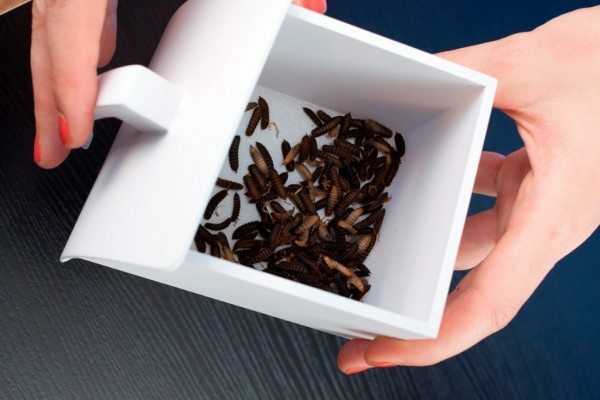 (FYI – there are actually a few restaurants in the United States that serve insects, but they are obviously not commonplace). 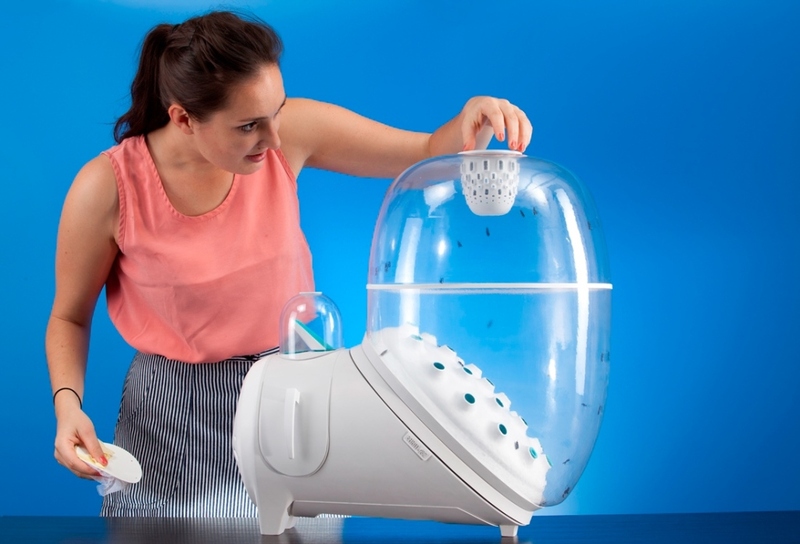 Farm 432 (developed by Katharina Unger from Austria) is the type of device that we may see in the future to help rear these insects in order that people may farm their own insect food. This video shows how the device works (from LivinStudio which was established by Katharina Unger). Because black soldier fly larvae have a high protein (42%) and fat (32%) content along with calcium, vitamins, amino acids and minerals, Ms. Unger focused on rearing these insects as food using Farm 432. In the future, we may see this type of device in kitchens and in businesses rearing insects for food. Currently, Farm 432 is in its Beta version and is unavailable for purchase but will be headed for production soon (according to LivinStudio). It looks like it is being used or tested in China and Malasia according to Ms. Unger’s twitter posts. It is important to note that not all insects are safe for eating. Brightly colored insects are often a sign of being poisonous. However, there are at least 2037 edible species according to a comprehensive survey of literature performed by Mr. Yde Jongema, taxonomist at the Department of Entomology of Wageningen University, the Netherlands. There’s a lot of information available about entomophagy. If you are interested, the following links are just a handful: Countries That Eat Bugs (U.S. News & World Report), Eating Insects Isn’t as Eco-Friendly As People Say (Time), We’re Outnumbered (University of California, Agriculture and Natural Resources), What’s stopping us from eating insects? (Scientific American blogs), Insects are Food: Entomophagy is the future, and Edible insects: Future prospects for food and feed security (Food and Agriculture Organization of the United Nations). A co-workers often brings in “cricket flour cookies”. Honestly they taste good, I just don’t like knowing what they are made of. Psst, Julie! You’ve got something in your teeth. I think it’s a cricket leg! Nothing “insecty” about the flour. Now you have a great excuse for eating cookies – you’re getting the protein that you need! I think that grinding insects up into flour and incorporating them into baked goods would be the only way that I could get any of my family members to try them. OK, but how do I tell my vegan friends they’re still eating animal protein? I’ve got one vegan friend who is so strict, he won’t eat honey because it’s an animal product. Yes, insects are considered animals. Sandee, even though you’re vegan friends are still eating trace amounts of insects (even in organic food or food grown in your garden), they are as close to being purely vegan as a human being can be! Besides, eating insects is very healthy! OK for those curious, Don’t google that. I think some day insects will be farmed for food. And processed into a soy protein like tofu. But I think it will mostly be larva. Not necessarily full-grown insects. And it will be hard to tell the source. And it will be a very cheap source of protein. @Kathleen: I can see it happening one day, but honestly by the time society would change enough I think it’d be more efficient to just grow meat (of whatever type you want) directly in a vat. Some cultures, primarily in Africa, Asia and South America, even rely on creepy-crawlies as their main source of protein. That’s why I often marvel at the survivalist shows where they eat live larvae without apparent concern for ingesting parasites or pathogens that the larvae might contain.